Unusually for parrot-like birds, cockatiels have adapted really well to life in captivity. They find life in our homes quite enjoyable providing they have other birds or their owners for companions. As they eat mostly dry seeds for food and are used to quite a dry environment, they aren't particularly high maintenance. Whilst some cockatiels can be quite noisy, it's not normally a problem. Most males have quite a pleasant whistle to their song. Cockatiels are generally quieter than a number of other parrot-like birds. Cockatiels are friendly and fun to be with. They are quirky, entertaining and great companions to be around. Pets cockatiels are best kept caged in pairs or as a flock in an aviary. To keep a pet cockatiel on it's own, you must make sure it has plenty of time out of it's cage with it's owners - or flock of humans! Cockatiels are not normally aggressive - in fact they are very sociable and have a lovely relaxed outlook on life. Many people don't know that they are also very intelligent birds. Cockatiels are very underrated as pet birds! Hand-reared cockatiels tend to be over-reliant on constant company for their whole lives. 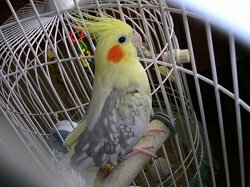 Cockatiels that are raised by their natural parents are much less likely to experience behavioural problems. Remember: cockatiels are often hand-reared but it's those that are raised by their natural parents that make better pet cockatiels. Cockatiels can live as long as 20 years or more if they are cared for well. They are active birds that need an opportunity to spread their wings and fly every day. They can be trained for certain commands as they are fast learners! Cockatiels make great pets birds and can be a great companion. They are very underrated as pet birds.